A long time ago someone made some phenolic spacers for the intake manifold... I bought one and never got around to installing it. I'm planning to do it this weekend, but was curious if anybody else has one, and how it's held up over time. I'd hate to install it and find out it's gonna cause a problem down the road. If you're worried, you should just sell it to me. Well, I hope to add to the list of people that have had no problems. I planned to do the install this weekend but realized much too late that despite a HUGE collection of 2.3l gaskets, I have no lower intake manifold ones. Ordered a pair (I think it's appropriate to gasket both sides of the spacer) and will hopefully do the install next weekend.... unless the weather hoses me. ... for about 4,000 miles, after which it catastrophically failed in traffic, leaving me completely stranded and fearing for the engine. 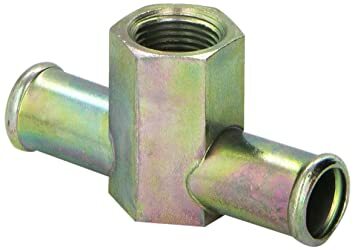 I contacted Dorman and they were very apologetic, assured me that it was rare for these tees to fail, and that they were fully intended for use with coolant in an engine bay. They sent me free replacements! The replacement lasted about 1,200 miles and five months. Failed again in the exact same way. At night, after parking the car and turning it off. Real mad. Dorman is inexplicably the only company that makes a 5/8x5/8x3/8 tee in this configuration. I don't want to use some giant kludgy brass NPT contraption up there. Worth noting is that I have a similar tee, but 5/8" all around, up front from Gates, positioned even closer to the manifold and it's *fine*. There is something utterly substandard about this Dorman tee. So, Dorman forced my hand - time for the spacer and blocking of coolant from the intake manifold entirely. I'm not using the temp gauge sender (it's been dead for years) and relocated the fan switch a long, long time ago so the only thing holding me back is the EGR tube, but I think I'll be able to bend it to make up the 1/4" I need. I hope I can, anyway! If you have the old plumbing, and a tubing cutter, the part is right there. I used the T where the intake manifold hose plumbs into the oil cooler pipe. I'd post a pic, but F'in photobucket is SO frustrating these days. On that, is there a functional photo hosting site that works for people these days? Mike McCreight wrote: If you have the old plumbing, and a tubing cutter, the part is right there. Re Photobucket if most if not all of many photos are dumped into your "Bucket" rather than into individual Albums in your Library the service will be verrry slow to load. I've got maybe 30-35 albums plus the main bucket and Photobucket loads fine for me. I've found that the Photobucket app is much friendlier. The website is just ad central lately. It still works ok for forum posting with the img tag but forget about browsing an album. I've been thinking of going to google photos. The reason I don't want to use brass is space and weight. I know that sounds insane, but it's a very small amount of space and the right combo of brass fittings is quite large and I don't like that pointless space and weight, and I hate having my engine look like I paid a plumber to fix it. I bought the correct array of fittings in aluminum to make it at least look like I tried, but it's still a physically huge intersection. There's no reason you should not be able to use plastic here, zero. I have a Gates 5/8" tee on the other side connecting the water pump to the "head tube" to the coolant reservoir, just inches from the exhaust manifold and it's been fine for a very, long time. This problem is purely poor Dorman quality... it's actually pretty sad because the crap Dorman part cost more than the good Gates part. But, it's okay, it's on the past. I paid good money for the spacer and it's going to get used! It was kind of an annoying fit - I could not get it placed without removing the valve cover - the Felpro Permadry gasket got in the way. Hopefully this activity does not result in a leak. I bought some Permatex "Permashield," which I've read is a clone of Hylomar Universal Blue with a cheaper solvent. It's $9 for vs $30 for 2oz, so I'll live with it! I used a foam brush to spread it all over the phenolic spacer, then "glued" one intake manifold gasket to each side. I hacked off the heads of a couple long M8 bolts to use as dowels to get everything lined up and install was pretty darned painless. The EGR tube required minor adjustment to fit properly, not a big deal. I don't know what it's for. Rockauto says it's an AC fitting that fits no cars. I placed it in the feed to the heater valve/core - it's where the CTS goes on dual-plug Mustangs, hopefully whatever slight differences in temperature it sees don't upset anything. I can't imagine +/- 10 degrees or so would... not on EEC-IV anyway. A Gates 28467 (5/8" L hose) got hacked up to go between the tube on the head, this fitting, and the heater control valve. A second 28467 plus a Gates 18701 (5/8" tight U hose) got hacked up to return the valve to the tubes. Looks very factory, I'll post a picture of it later. One less hose, maybe a cooler intake, and hopefully no more coolant all over the place! Guess I'll keep an eye on that Gates coupler, but it can't fair worse than the garbage Dorman one! 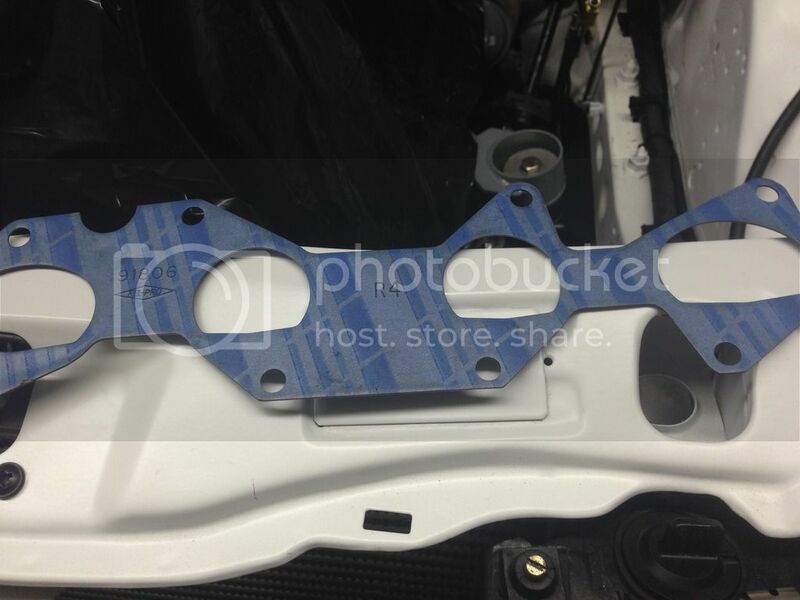 Curious why you would need the spacer for the intake when you can get a gasket that doesn't have the hole for the water passages (if you were blocking the coolant from the lower intake)? "Made for a 1984 Ford LTD 2.3L LPG (propane). Get one at rockauto for $6." dunhamr1 wrote: Curious why you would need the spacer for the intake when you can get a gasket that doesn't have the hole for the water passages (if you were blocking the coolant from the lower intake)? How long would just a gasket hold up to the heat and pressure unless you had something solid behind it? Yeah, I just wouldn't trust that. It's probably fine, but I don't want to replace one problem with another. If I was going to do something like that, I would place some thin stainless between the gasket and manifold as reinforcement. I've seen people do that on wet carb'd V8 manifolds. Used a similar technique to block the exhaust heated choke port on my Cadillac 429. But, the point here was equally "phenolic spacer" and "block coolant," and I already owned the spacer. No point in buying more stuff. Have you guys seen the gasket? It's not a typical paper gasket if that's what you're thinking. The gasket measures .0480" thick and it has a steel core. I'm eliminating water from my lower intake and I'm using this gasket because I can't get my hands on a phenolic spacer. I'm planning a 4500 mile round trip to Carlisle and running this gasket doesn't worry me at all.